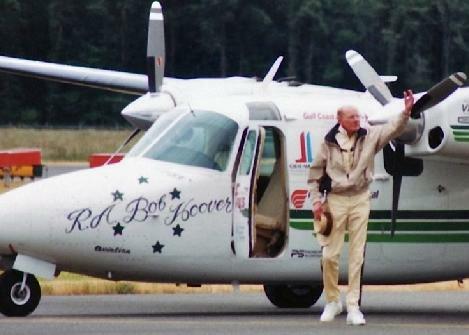 Like many pilots I have talked with Bob Hoover several times over the years. Mr. Hoover has always been very generous towards his fans and fellow aviators even though his aviation accomplishments tower above many less affable pilots. Recently I asked Bob if he would tell pilots how he got his medical back and how he knew when it was time to quit flying. Graciously he talked for an hour about these difficult experiences. Most pilots are acquainted with Hoover’s aviation career but a brief overview is warranted. When he started flying he fought through severe nausea just learning to fly. During his military career he was awarded the Distinguished Flying Cross, Soldiers Medal, Air Medal and Purple Heart. In his 59th World War II mission during World War II, his malfunctioning Spitfire was shot down off the coast of Southern France. He was taken prisoner and spent 16 months in a German prison camp. Hoover escaped from the prison camp, stole a German fighter plane and flew it to the Netherlands. Bob Hoover was also a test pilot in the Bell X-1 program and flew chase with Chuck Yeager during the Mach 1 flight. On the 50th anniversary of the Mach 1 Flight, Hoover again flew chase in an F-16. In addition to his distinguished flying service, pilots worldwide covet Hoover’s precariously precise air show performances. Hoover’s engine-out and iced-tea pouring maneuvers are among his many viral downloads within the aviation community. When Hoover’s medical was revoked by the Federal Aviation Administration (FAA) in the early 1990’s, few understood why this had occurred and today perhaps even less understand what really happened. 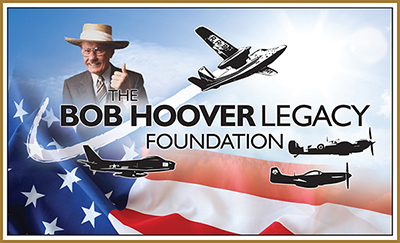 Over the years Bob Hoover has certainly made many comments about losing his FAA medical but during our recent chat he provided several key elements. Bob set the stage by reminding me that the mandatory retirement age for professional airline pilots was 60. This was a hotly contested FAA rule and Bob Hoover was a 70 year old professional pilot flying high-risk maneuvers. When Bob’s medical condition was called into question, he voluntarily sent in his medical. Later, when he asked the FAA to return it, the FAA revoked his medical. He said he was so disappointed that his country [which he had served] had grounded him. Hoover vigorously contested this action by retaining F. Lee Bailey as his attorney. The fight to get his medical back was a long arduous process during which Hoover obtained an Australian pilot’s license, and a medical certificate by Australia’s aviation authorities. Bob Hoover’s American (FAA) medical certificate was ultimately restored, and he returned to the American air show circuit for several years before retiring. So how did he get his medical back? Many believe that the support from Hoover’s fans and his aggressive legal action were the solution. It is certainly true that Hoover has never been short on fans and that his medical re-certification included a powerful legal component; however, the FAA did not yield to litigation and they were not moved by the gargantuan outpouring of support by his fans. In fact, the document trail reveals that the FAA process became much more adversarial once legal process was initiated by Hoover and his attorney F. Lee Bailey. While Hoover’s litigation was initially successful, the favorable decision was quickly reversed by the NTSB and did not result in FAA medical approval for Hoover. Bailey and Hoover filed appeals all the way up to the Supreme Court and lost. Ultimately Hoover was able to convince the FAA administrator by delivering convincing independent medical evaluations. Hoover gave medical documents, which supported his fitness to fly, to a trusted friend who hand-delivered them to David Hinson, the FAA Administrator at that time. Within a few days after receiving the medical evaluations, Hinson called Hoover and told him he was back on flight status. Hoover went on to perform air shows until he was 80 and continued to fly until he was 85. Perhaps one of the most interesting things Bob told me during my recent interview with him was how he decided it was time to quit flying. Bob said that he believed that he would always know when it was time to quit. To assure this, he maintained high calibrated standards such as target speeds for particular points in his loop maneuvers. When he failed to meet these self-imposed criteria he grounded himself. You might be inclined to think that only a case like Bob Hoover’s would garner this much FAA attention or that pilots routinely defeat the FAA in legal proceedings. A General Accounting Office study of the FAA’s use of emergency revocation found that the FAA decision to revoke certificates is upheld 86% of the time. The odds of a pilot resolving an FAA medical case with litigation alone are not good. While it may be difficult to resist the urge to fight through such a heavily bureaucratic process without engaging an attorney, remember thousands of cases are resolved each year by simply working an aeromedical checklist which is certainly cheaper than drawing battle lines with the FAA and pitting your attorney against the government’s legal team. But, what about that cool international maneuver Hoover pulled-off in Australia? Is that something we should consider when we run into the aeromedical storm? For most U.S. pilots, international reciprocity is not a reliable solution. FAA medical certification is generally equal to, and in some cases more liberal than, other countries. On the other hand, leveraging US approval to gain certification reciprocity in smaller countries can be a viable option for foreign pilots. Many smaller countries have less access to their governments than American pilots and Pilot Medical Solutions has helped several pilots obtain FAA medical certification with the goal of obtaining reciprocity from the pilot’s home country. So, if you find your FAA medical is in jeopardy, remember what ultimately worked for Bob Hoover. Find someone who knows what the FAA requires, a trusted expert who can assure that the essential documents are delivered to the right person. If you are well-informed and exercise cautious cooperation with the FAA, your aeromedical moves may even turn out to be more effective than Bob Hoover’s.